Lightweight, foldable transport wheelchairs combine the features of a self-propelled wheelchair and a portable rollator. These wheelchairs have small wheels instead if the large wheels of a standard wheelchair, so you won’t be able to propel it yourself. A family member or caregiver pushes the chair instead. Transport chairs make it easier to go to the mall, the doctor, restaurants or theaters. They give you (or your relative) the freedom to accompany others to outings or events. Most transport wheelchairs weigh less than 20 pounds and can easily be broken down and stored. These lightweight wheelchairs make it easier for you to travel by plane if you’re elderly or disabled. They can be folded and checked as baggage, so you won’t need to worry about taking a long time to disembark at your destination airport. Should You Use a Transport Wheelchair? A transport wheelchair (also called a companion wheelchair) will work if you’re unable to propel a wheelchair on your own and need a relative or caregiver to assist you. For frequent trips to the doctor or therapist, a lightweight companion chair is easy to lift and store in car trunks. Use these chairs for short trips outside the house, such as appointments or social events. If you have a caregiver or other people to push you, the transport chair will help you get to and from outside locations. If you need to use a wheelchair in your home all day, you should choose a standard, self-propelled, adjustable chair. Use a standard model if you can walk with a cane or walker indoors, but need a wheelchair to traverse longer distances outdoors. Self-propelled wheelchairs have two huge push rim wheels. You turn these wheels to move the chair. Most self-propelled chairs contain push handles in the back in case you need help transporting the chair. Self-propelled wheelchairs are big and bulky and lack the collapsibility of lighter transport chairs. Learn more about the difference between a companion and self-propelled chair to make an informed buying decision. You’ll need to consider the width of the hallways and doors where you’ll transport your loved one. Does the building have narrow entrances, curves, and angles, or are the doors wide enough to accommodate a larger wheelchair? The wheels on transport wheelchairs may measure under 7-inches or up to 12 inches. Larger, extra-wide wheels improve operation over rough terrain. A chair with small wheels causes a bumpy or uncomfortable ride. Select a chair with wheels over seven inches if you’ll spend a lot of time outdoors. If you need the wheelchair for indoor use only, small wheels will suffice. Check the size, shape, and material used for your chair’s back and seat rests. A flimsy, poorly constructed seat makes sitting in a wheelchair for hours uncomfortable. Choose a transport chair with a padded, foam or gel cushion to stay secure even on long trips. Buy a separate seat or back cushion if you need one. Choose a wheelchair that supports your weight (or the user’s weight). Check the folding weight of the chair for storage. Ultra-lightweight models may weigh between 17-19 pounds and be easy for older adults to place in a car trunk. Heavier chairs may weigh up to 50 pounds, folded. Most transport chairs have a flexible sling seat design, where a swath of vinyl or fabric stretches between two sides of the chair. Some wheelchairs have a bar across the front of the seat to offer extra support. The third bar may hit the back of your knees if you have short legs. 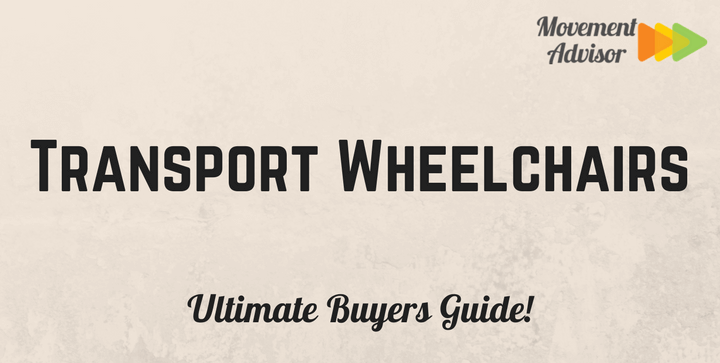 What Else Should I Know about Transport Wheelchairs? Transport wheelchairs come in three seat sizes – 17 inches (narrow) for users under 120 pounds, 19 inches (medium) wide for 120-300 pounds, and 22-inch or more (extra-wide; also called bariatric or heavy-duty) for users over 300 pounds. You can fold a transport chair and store it in any small space. Many chairs fold to 2.5 feet by 9 inches. Swingaway leg rests hook on and off so you can use them when needed and save space when storing the chair. Transport wheelchairs provide foot locking breaks on the rear wheels. A few models offer handbrakes, like ones on a bicycle, instead. Most transport chairs provide fixed armrests. A few models feature removable armrests, which make it easier for some people to use the chair. You may be able to purchase padded cushions or other items as extras or replacement items. Contact a customer service rep for the wheelchair company for details. Ranked highly on Amazon, with 69% 5-Star and 18% 4-Star ratings, the Drive Medical Lightweight Steel Transport Wheelchair offers you a smooth, bump-free ride. Its composite eight-inch wheels ensure a superior ride indoors and on most outdoor surfaces. This Drive lightweight transport wheelchair has a 17-inch seat, slim enough to navigate narrow hallways. The durable, scratch-resistant steel frame provides support for you or for any user who weighs up to 250 pounds. The swing away footrests and padded armrests guarantee better comfort if you have to sit in it for hours at a time. The easy-to-clean nylon seat upholstery looks great and provides enough padding to keep you at ease no matter where you go – to museums, restaurants or concerts. The safety seat belt keeps you secure even when going over harsh terrain. You can use this wheelchair on cruise ships, in airports, museums, zoos or for any other travel or day trips. After use, this 26-pound wheelchair folds up to fit in your trunk. After use, this 26-pound wheelchair folds up to fit in your trunk. It has a limited lifetime warranty. Ultralight Transport Chair offers a safe ride, with six-inch front wheels and eight-inch back wheels. Amazon reviewers give the Ultralight Transport Chair a 73% 5 Star rating. Many users have found that the brakes are easy to use and enjoyed the ultra-lightweight nature of the chair. This easy-to-handle transport chair has a high-grade aluminum framework. It supports up to 300 pounds and folds down the back for easier storage. Stow ‘N’ Go clips let you lock footrests to the side when you’re not using the wheelchair. Several features give you more comfort than the average transport chair. The restaurant-style fixed armrests fit under most standard size tables and desks. Soft nylon upholstery makes sitting for long periods more comfortable. It even comes with a cup holder, so you won’t have to hold drinks in your hand and risk spills. The Drive Medical Fly Lite Ultra Lightweight Transport Wheelchair lives up to its name. It’s sturdy, but lightweight aluminum frame gives you all the support you need while you conduct your daily activities. The wheelchair’s blue frame, along with its blue plaid seat and back covers, gives this model a different look from the run-of-the-mill black and silver chair. With a weight capacity of 300 pounds, it’s suitable for most users. The Fly Lite has eight-inch casters in the rear and six-inch casters on the front, which are perfect if you use a wheelchair indoors most if the time. The aluminum rear lock wheels offer a safer, smoother ride. The Fly Lite Transport Wheelchair has a standard 19-inch seat to give you enough room and still be narrow enough to maneuver through tight spaces. The handy back pocket lets you stash a cell phone, keys, and other small items. The chair has a seatbelt for added safety, and you can buy a cup holder to make long trips more pleasant. You can fold down the back of this 17-pound wheelchair for quick transport and storage. Family, friends or caregivers can lift the chair without help and store it in a car trunk. This transport wheelchair comes with a limited lifetime warranty. With so many choices available from Drive, Medline, Karman and other top wheelchair manufacturers, you should talk with your doctor or medical supply representative about what constitutes the best transport wheelchair for your situation.